Take your client's kitchen from frumpy to fabulous without breaking the bank. In a tight economy, more people are choosing to stay in their homes and redecorate rather than buy a new home. Yet even with that shift, renovation budgets are shrinking. Clients are demanding more cost effective designs and looking for the maximum change for a minimal expense. One of the most popular renovation projects is a kitchen remodeling. But it can also be one of the most expensive. So how can you meet your client's demands for big changes on a small budget? Here are some suggestions for keeping budget-conscious clients happy. Adding a whole new look with glass or decorative kitchen cabinet panels. 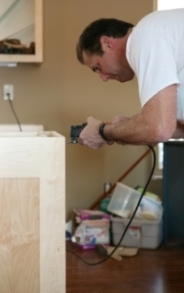 Sanding, priming and repainting existing cabinets to give the room a completely new look for a much lower cost. Replacing door and hinge hardware with themed, handcrafted or other premium hardware. The hardware acts like jewelry, accenting the rest of the design with texture or color. Saving money on cabinets will free up funds for truly outstanding custom hardware. Selecting local tile for flooring and back splashes will reduce shipping costs, a critical factor in today's high energy cost environment. This idea started with some of the country's top interior design firms as their clients demanded a more unique look in their homes. Using local materials adds a regional flavor to the design project, differentiating it from the mass produced products in box stores. If your client trains horses in their spare time, consider adding a few touches that reflect that passion. Don't go overboard � horse-themed wallpaper, ceramic horse statues on the counters, or saddle- shaped bar stools probably crosses the line from tasteful to tacky. But an artistically framed photo of your client's first horse, a riding crop, or other small piece of tack can add a welcoming feel without being too much. Best of all, your client probably owns items that can be re purposed to use in the space, keeping project costs lower. One of the hottest interior design ideas over the past few year has been refitting classic appliances with modern functionality. Classic round cornered refrigerators, antique wood stoves and even small appliances like 1950's toasters and blenders have been rewired and upgraded to current kitchen standards inside, while maintaining the vintage look and feel on the outside. The project gives clients a unique look modern appliances, even replicas, can't match. Plus the project is green, saving hard to dispose of appliances from dumps and landfills. One side affect of the economic downturn is a huge jump in reported stress levels. Help your clients manage and enjoy their design project by choosing simple solutions (like replacing old doors with new decorative kitchen cabinet panels instead of ripping out the cabinets), breaking larger projects down into smaller stages, or scheduling messy remodeling when the clients will be out of town.